Anybody who has been involved in the launch of a new and innovative product, such as a deodorant with a new dispensing system or the re-launch of an ice cream line, knows it can be hard to motivate consumers to act. One of the most important things in getting consumers to try your product is to communicate the benefits your product offers. However, even if consumers are convinced that your product is right for them, there are always other forces at work preventing them from acting – e.g. concerns about taste, convenience or substantiation. This inertia is stronger in some markets than in others. At SKIM, we understand the reasons for this effect in the markets that we serve. In some cases, inertia is a factor which is hard to overcome; while, other times inertia is caused by doubts or concerns about a product or brand which can easily be alleviated. Our solution ‘Drivers & Barriers’ is designed to show both sides of the story. On one hand it shows to what extent consumers are triggered by a positive benefit. On the other hand it shows what should be said to overcome their barriers. The combination delivers a forecasting instrument to determine what portion of the market can be reached by combining the right concept with benefits and reassurances, providing input into a holistic communication approach. The result of a Drivers & Barriers study is an optimal communication mix to maximize the likelihood of consumer uptake. Drivers & Barriers is based on insight into the consumer’s choice and decision making behavior – SKIM’ core field of expertise. It demonstrates that a good idea may move and inspire people, but it takes more to make them act. The idea stresses that moving to a new situation requires the new situation to be better than the old one, but also that consumers’ concerns are addressed. That’s because moving to the new situation requires action, and it is far easier to do nothing than to take the risk. Step 1: Identify a list of potential drivers and barriers to using your product. If there is sufficient market and consumer knowledge within your company, this can usually be done in collaboration with your marketing or product team. Alternatively, SKIM can help you uncover these drivers and barriers with our team of in-house qualitative experts who specialize in communications. Step 2: The importance of each trigger and barrier is validated quantitatively. This enables you to see how much of the market possesses that trigger or barrier and which are most important for your communication efforts. Step 3: Consumers who exhibit barriers to product usage will identify which reassurances help them to overcome those barriers enough to increase uptake. 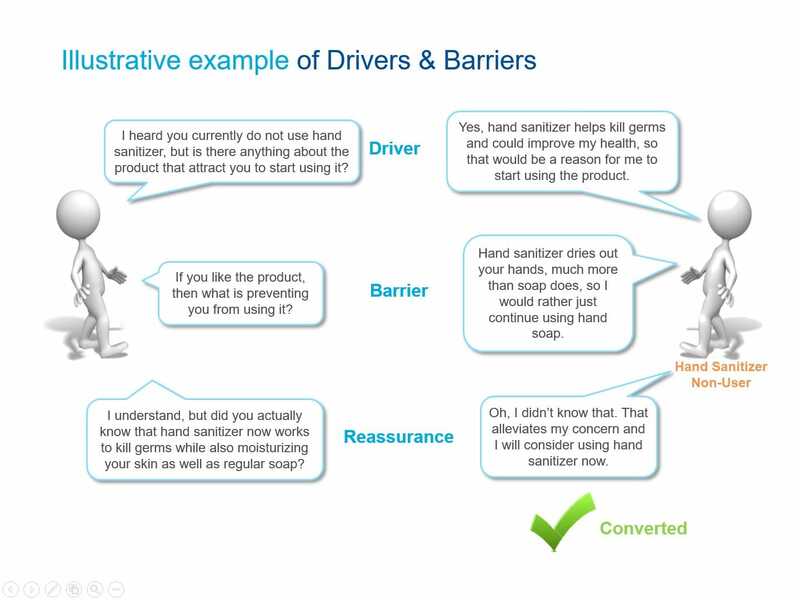 The end result of a Drivers & Barriers study is a thorough understanding of what prompts consumers to use your product in addition to the most crucial barriers which prevent them from further embracing your offerings. By also focusing on the reassurances you are able to see how effective certain communications are at overcoming these barriers, ultimately increasing product trial and usage. This combination delivers a forecasting instrument to determine what portion of the market can be reached by combining the right concept with benefits and reassurances. With this knowledge in hand, you are able to define an optimal communication strategy which can simultaneously prompt consumers to use your product while also removing the doubts which currently stand in their way.